Your Data Center. Our Data Center. Together, Serving Your Business. The secret to a seamless hybrid cloud is consistency. VMware on-premise meets VMware in the cloud. Same metrics, same VMs, same experience. But, with your data and VMs housed in the cloud, it’s critical you marry seamless platforms with exceptional management. Without visibility, you can’t have confidence in your cloud vendor – whether for Infrastructure-as-a-Service or DR-as-a-Service. Some clouds were built as foundations for SaaS plug-ins. Some clouds were built for hacking. The iland Secure CloudSM was built for business. When choosing a partner for your hybrid cloud, you’ll be looking for flexibility, performance, capacity, and ease of use. iland Secure Cloud comes with a range of straightforward pricing options, enabling you to make the right choices for your business, both in growing and shrinking your footprint. iland Secure Cloud can support a range of workloads, including very large VMs, physical systems and even colocation in any of our global data centers. Finally, as a vCloud-based cloud, your VMs do not need to be changed or reconfigured to run on our cloud, smoothing the transition, easing management, and maintaining consistency. iland’s VMware-based cloud platform was built to make migration to cloud straightforward. VMs already operating on an on-premise VMware environment need no reconfiguration to run on iland Secure Cloud. And, if you ever want to bring those workloads back on-premise, you can avoid retrofitting those same workloads, as often happens with other clouds. 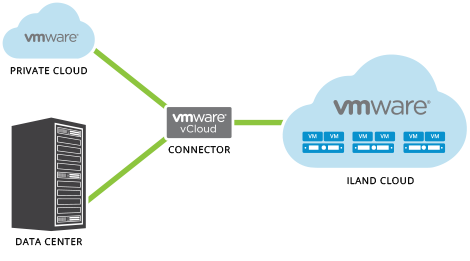 VMware’s vCloud Connector plug-in links your on-site data center with iland Secure Cloud. 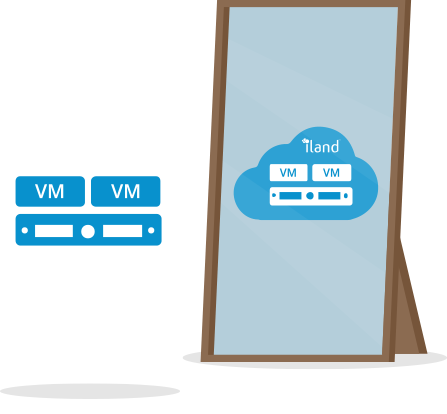 It enables you to quickly move from your on-premise cloud to the vCloud Air Network, of which iland is a provider.